In our Shooters’ Forum, there’s a long-running thread entitled Pride & Joy Rifles. There you’ll find dozens of fine firearms — from hunting handguns to long-range benchrest rigs. 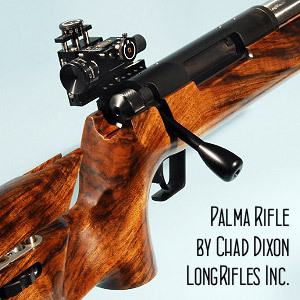 A while back, Forum member John L. (GunDog64) posted this handsome Palma rifle, built by Chad Dixon. John reports: “Here is my new ‘Pride and Joy’ Palma rifle. The action is a chrome-moly Barnard supplied by MT Guns. The gun is set up for switch-barrel use with two Medium Palma-contour Bartlein barrels, one chambered in 6CM, the other in .308 Winchester. Both barrels feature 5R rifling. Up front is a Riles 30mm front sight, while the rear sight is a Warner. The stock was crafted from a superb Turkish walnut blank supplied by Luxus Gunstocks in Mt. Orab, Ohio. All gunsmithing and assembly work was performed by Chad Dixon at Long Rifles Inc., Sturgis, South Dakota. Chad designed the trigger guard, handstop rail, recoil lug, and cheek-piece adjuster. John, the rifle’s proud new owner, completed the finish work on the stock. John reveals: “This project was a year in the making but well worth the wait”. Share the post "“Pride & Joy” Palma Rifle in Turkish Walnut"